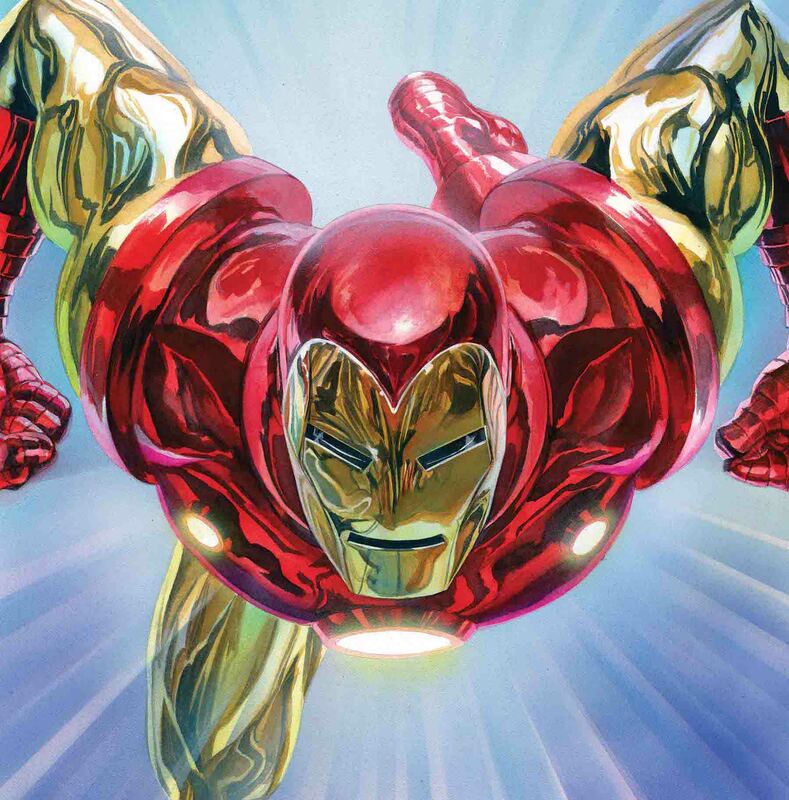 'Tony Stark: Iron Man #1' review: Fun and inventive just as Tony Stark should be – AiPT! A great first issue that new and old fans alike can enjoy. On December 28, 2016, Civil War II #8 revealed Iron Man was potentially out of commission for a long time. Nobody knew at the time it’d be about a year and a half, as he’s only woken from his coma a few months ago. Tomorrow, Marvel Comics releases Tony Stark: Iron Man #1 which marks the first time Tony will be leading his own book in quite some time. That’s exciting as it promises a new direction, a new creative team, and a Tony Stark who has been refreshed by being taken off the board. Both of these creators are primo talents. Dan Slott has done epic things with Spider-Man, writing the series for over 180 issues and producing one of the finest comic runs ever with Superior Spider-Man. Valerio Schiti has proven himself an excellent superhero artist on books like Guardians of the Galaxy and Ms. Marvel. Do not let the price of this book at $4.99 deter you. It’s not a cash grab because of the #1 on the cover or because of the new creative team. No, this book is packed to the brim with entertainment as it sets up a new status quo for the character, new supporting characters, and supplies excellent action. It’s also quite good at fleshing out Tony Stark’s personality, opening with a flashback when he was a kid crushing at robot war type events and peppering the issue with his trademark wit and humor. There are moments in this issue that feel very much inspired by Robert Downey Jr.’s Iron Man which will make this a great read for those who like that iteration of the character. Slott has written quite an entertaining issue that even comes with a “The End” on the last page to help solidify the fact that this is its own story. In it we meet a new robot helper of his, an old competitor, and begin to understand a new kind of threat that Tony’s organization will be up against. 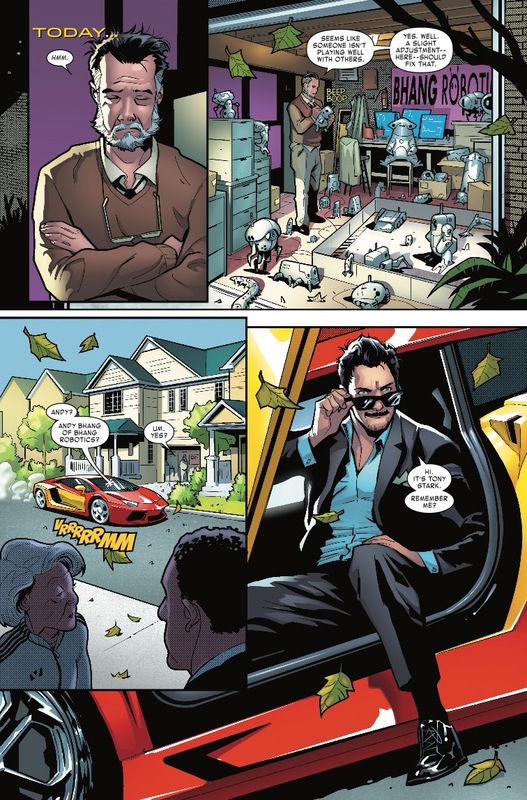 The company Tony runs is called Stark Unlimited and serves as a kind of invention mecha seemingly to better humanity — or more likely, to let geniuses tinker on his dime. It gives Stark’s business a more fun and easy going outlook with the added benefit of helping the world. Schiti, along with colorist Edgar Delgado, does a great job with the superhero stuff and scope required to fill the pages of one of the greatest heroes of all time. There are a lot of double page layouts in this issue, all of which help stretch the story a bit, but also make it feel larger than life. That’s important because one of the most successful elements of this issue is how it makes you believe Tony and his company can do anything. There’s a creative spark in the art that helps convey how a talking cat could actually be a reality. I don’t want to spoil who the big bad guy is in this issue, but I will say we get three new Iron Man suits to ogle — each of which is impressive in their own ways. …very well to this page. Two things caught me as potential issues for readers, though I think most won’t care or even notice. The first is the general feel of Stark Unlimited which is not too different from Horizon Labs. That was a similarly built tech company in Amazing Spider-Man that funded amazing projects and helped geniuses achieve their dreams. I’m sure there will be new details that help define this company differently, but in this issue, it doesn’t seem all that different. The other issue is how Slott writes Andy Bhang, who serves as a surrogate for the reader and ends up with very little characterization. We get the idea he’s a man who loves robotics, but we’re told more than once he’s not half the genius of Tony Stark. You’ll begin to question why he’s even being brought in to help Tony and aside from a well-timed save near the end, he doesn’t get much to do besides stand around and watch in amazement. Similar to my previous gripe, however, I imagine we’ll be getting much more development of this character going forward and probably a clearer grasp of why he was really brought in. I really liked the energy of this book, as well as the sense of scope. Marvel has done a great job with these new #1 series, revisiting the characters and giving them new layers of personality and direction. This is yet another Marvel #1 you should add to your pile and it’s a fun ride for seasoned comic fans and beginners alike. This is Iron Man the way he should be: inventive and fun! A strong first issue revealing a fun and inventive series.